Tim Berners-Lee, creator of the World Wide Web, was in Barcelona last week, receiving a honoris causa doctorship in the Open University of Catalonia (UOC). He spoke with some journalists, one of the Ismael Nafría, director of digital contents of Godó Group, publisher of one of the most important Spanish newspapers, La Vanguardia. Nafira publishes in his blog Berners-Lee’s answers to his questions, one of them how he access information. First of all, answered Tim Berners-Lee, he listens to radio everyday early in the morning, while he drives his car going to his job. Secondly, he search for information on the Web. Thirdly, he also reads newspapers. 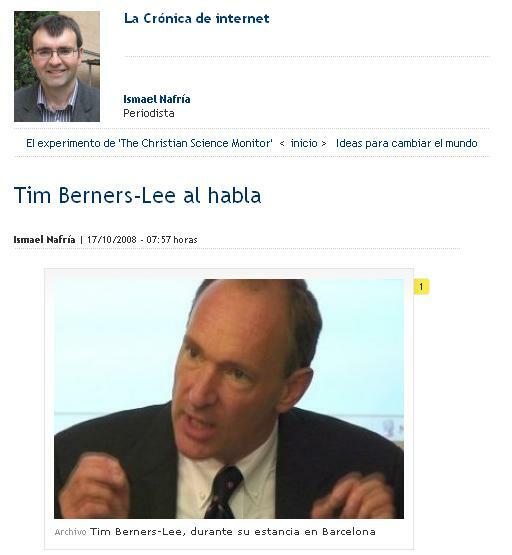 (Please read more on Ismael Nafria’s blog: La Crónica de Internet). By the way: La Vanguardia, 127 years old newspaper, one of the oldest in Europe, has recently opened to free access his historic archive, with great success.